Every night I persuade myself logically to wake up early next morning. I voice a million of constructive reasons and nod to the sound of them righteously, imagine loads of time I’ll get and plan how to spend it usefully. Then, when the morning finally comes - my reasoning is shattered in seconds. I turn the alarm off and keep snoring furiously for at least three more hours. Now, why does that keep happening to me and the majority of human race? Because all the arguments, no matter how compelling, fade away the minute your feelings and urges show up. Most of us are driven by emotions our entire lives! So, store owners, how to use that to your advantage? Think of this - do you ever feel like you badly need a product you didn’t know existed 10 minutes ago? I bet you do. Something attracts your attention in a physical or online store and appeals to the subconscious portion of your brain somehow creating a strong impulse to buy. Today, we’ll discuss these subconscious urges consciously, learn what they consist of and how to evoke them on cue. You’ve seen people squashed together, with eyes sparking crazily, in long lines during Christmas sales, right? It’s called shopping frenzy and it’s caused by a simple drop in price - the one bait a rare person finds will to resist. According to Brandon Gaille, over 90% of shoppers make unplanned impulse buys from time to time, and the most motivating factor for them is item’s price. Fascinating, huh? If your store isn’t offering any discounts, make up a few tempting offers right now! Laziness is the other crucial principle guiding our daily life. For instance, no one wants to conduct researches himself - reading the comment section below product descriptions - that’s about all the effort we’re willing to put out. Subconsciously, we feel that’s enough. If the crowd wants something - it must be good, that’s the reality perception most of us share, whether we realise it or not. So, make sure your site is filled with social proof - positive feedback and reviews - they reassure and incline shoppers towards buying. These words hypnotize people like spells from Harry Potter books. When you say something’s free it triggers human’s innate desire to get benefits randomly, whilst the word “limited” creates a sense of urgency and adds a prestige value to an item. So, whenever you sell, mention what’s free about the product - a costless stand for a cup, for example, a ski suit for a pair of skies, free shipping, etc., and say that the item is of a limited edition - everyone wants their goods to be exclusive. Here’s something you might haven’t heard about: 90% of buying decisions are based on the color alone. That statement’s taken from a great Quick Sprout infographic. Evidently, the color red is worth mentioning the most - it nudges people to perform purchases, as said by Linda Cahan. However, store owners should be careful, too much of bright coloring might irritate customers and make them leave promptly. So, test what works for you - intensely or mildly red Call to Action buttons and neutral coloring otherwise. Or, maybe, some other designing approach. As the rule of thumb, it’s recommended to color only 20% of your web pages brightly in the action oriented sections. Each of your clients has an idea of what he/she is in terms of social status, and apart from a few people with low self-esteem, everyone’s sure he’s great on the inside. So, it is your major task to reinforce that belief, that way you’ll endear yourself to the target audience. Try to define your shoppers self-identification and probable aspirations, and build your marketing campaigns appropriately. Let’s assume you’re selling watches. Who’s most likely to want them? Not teenagers, right? And not elderly people. It’s middle aged businessmen who want to be/appear successful. So, make sure your product photos contain prosperous-looking, business type dudes, with self-confidence dripping from their greasy, stylish hairdos. If you’re making video presentations - a guy like that should be talking to your clients from the screen - he’s the one they can or want to be able to relate to. 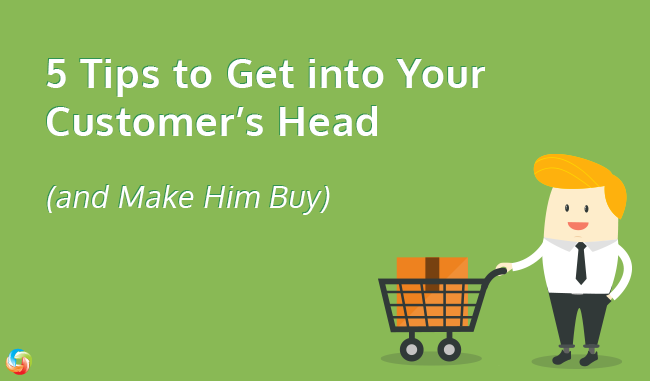 These five tips won’t make you Milton Erickson, but they will help you get into customers’ heads and incline them towards making purchases. If you’ve got more tips for building a subconscious rapport with clients - we’d be glad to read them in the comment section.